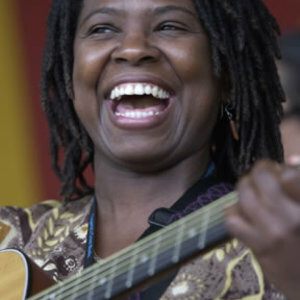 Ruthie Foster is an American singer/songwriter of blues and folk music. She is from Gause, Texas and from a family of gospel singers. She studied music at McLennan Community College and then worked in the US Navy, where she started performing. Her debut was released in 1997 and she has performed in North America, Europe and Australia. She has often been compared to Ella Fitzgerald and Aretha Franklin. She is from Gause, Texas and from a family of gospel singers. She studied music at McLennan Community College and then worked in the US Navy, where she started performing. Her debut was released in 1997 and she has performed in North America, Europe and Australia. She has often been compared to Ella Fitzgerald and Aretha Franklin.